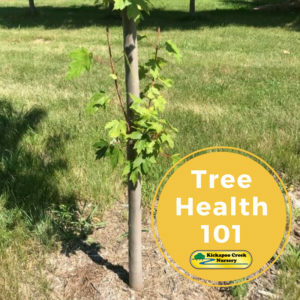 Trees need check-ups just like we do. You may commonly see suckers, which are small stems growing from the tree taking place in the summer and fall time. This is a sign that the tree is experiencing problems and you need to remove them. Suckers obtain energy from the tree, taking energy away from where it is essential. Eliminating these suckers can be removed easily with the proper tools and technique. 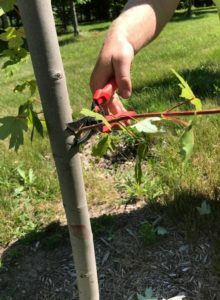 Removing suckers at an early stage of growth is important for the overall health of the tree. When suckers go untouched for a considerable amount of time, they can turn into large branches. Large branches leave a larger wound for the tree, which will in return grow more suckers and make the tree susceptible to disease. If you have a sharp pruner or looper at home, this is the best way to remove suckers that form. Getting as close to the trunk when pruning away the sucker is highly important and okay. You want to replicate a smooth surface for the tree. At Kickapoo Creek Nursery we have a word of wise when removing suckers. If there is room for a hat to rest on the leftover sucker, it wasn’t removed all the way! Hydrangeas: How Can I Change the Color and Is it Easy?